MIPS CEO Johan Thiel says 19 cycling brands use (or will soon be using) his company’s safety technology (click to enlarge). By now you’ve almost certainly heard about MIPS — aka multi-directional impact protection system. The Stockholm, Sweden-based company with the same name was founded in 2001 and has one product: the MIPS Brain Protection System, which separates a helmet’s shell and liner with a low friction layer that’s designed to reduce rotational forces on the brain caused by angled impacts to the head during a crash. Since launch, MIPS has become ubiquitous in the cycling industry. 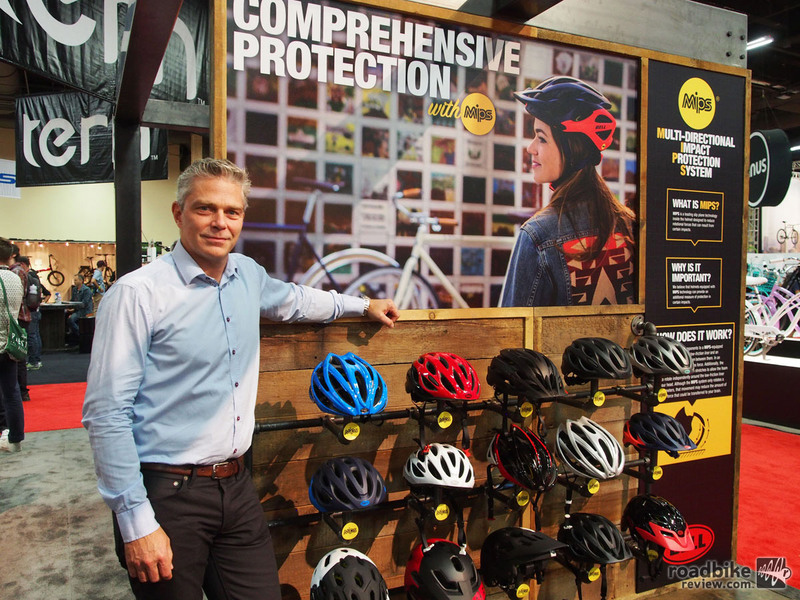 At September’s Interbike cycling industry trade show in Las Vegas, MIPS CEO Johan Thiel claimed that 19 attending companies had (or would soon have) MIPS equipped products on the market. Overall, Thiel estimates that roughly 400,000 MIPS units have already made it onto consumer heads worldwide, and that number is increasing quickly. The total number of brands from all sports segments is 44 and climbing. 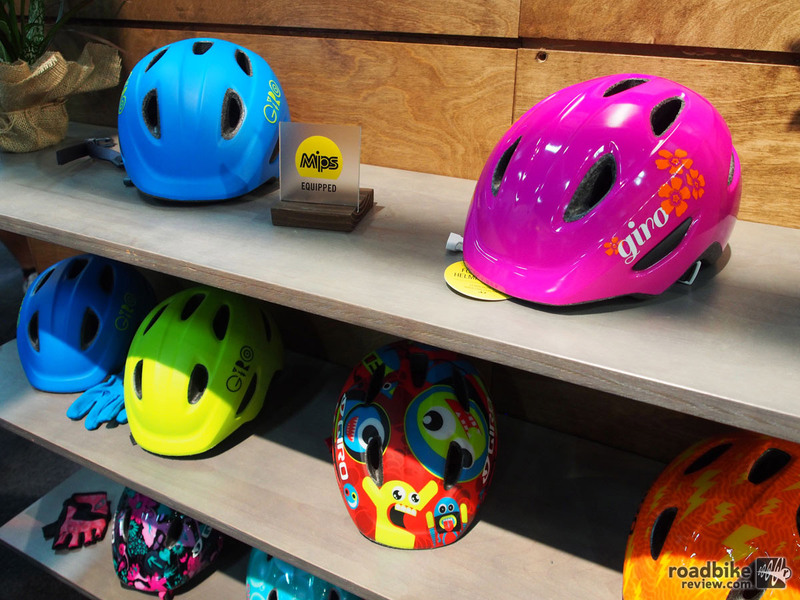 Helmet makers such as Bell and Giro have been some of the most eager adapters, a fact reflected in the sheer number of MIPS equipped helmet models each company has, and that parent company BRG Sports has invested in MIPS the company. Generally speaking a MIPS-equipped helmet costs $20-$25 more than its non-MIPS equivalent. MIPS has even found its way into kid’s helmets (click to enlarge). Thiel is undeterred by such skepticism, as we found out during a lunchtime interview with the MIPS CEO during Interbike. Here are some highlights from that conversation. RoadBikeReview: How often do you hear from people who feel like MIPS changed the outcome of an accident for them? Johan Thiel: Quite often actually. Just in the last three weeks I have heard from people who had sever crashes who were grateful for having the product. No we can not prove that absolutely it was MIPS that made the difference. But we know our technology works based on the tests that we have done. So it feels good to know that consumers are grateful for what we are doing. It makes a difference having a helmet and it makes a difference having a helmet with MIPS. RBR: You have strong adoption in the bike helmet world, so what is next for MIPS? JT: Our objective remains the same. We are looking from a science point of view on how we can save lives, specifically by protecting the head and brain. That is where we came from and that is our knowledge base. We also have other computer models such as the human neck that we are looking at. But right now our focus remains on the brain. We are an ingredient safety company so we are always looking into other products that could help save lives. That could be indication that EPS part of a helmet is too worn out by way of installed sensors. That’s probably not something you will see in the next few years. But maybe in five years. We also are looking at what we can do in other segments besides sports. That could mean things such as police, fire, and military. Electric bikes is another interesting segment. We need to look at what special needs will be there. But sports remains our mainstay right now. RBR: What have you learned about the cycling helmet industry in general since starting your company? JT: I think the No. 1 thing is with how the helmets are built and tested. We have found that the testing is not enough. The companies are not testing what happens in real life. You have an angle to the ground and that angle causes rotational forces and that is something that has been left out. Yes, the helmets are great and are saving people’s lives, but I think the industry doesn’t really know what happens when you fall. That’s why we are still very much in the education process with what MIPS can do for people. What’s next in this “scientific” series, are you going to ask Michael Jordan if Air Jordans are a good sneaker? ” No we can not prove that absolutely it was MIPS that made the difference.” Well then stop talking! At least get Mr. MIPS to comment on the Bicycle Helmet Safety Institute paper that was critical of his product — and a legitimate criticism it would seem. The MIPS helmets I’ve handled are also noticeably heavier despite having less liner and the “void”, what’s up with that? A bigger “lever” on my head while I’m impacting some immovable object? I think not. These are all excellent points. Nothing can actually “prevent” concussions aside from avoiding the head-slam in the first place. MIPS technology is bogus . . . although I also had a tbi recently, I can’t see myself shelling money out for this false sense of security. The best tactic, regardless of helmet, is to avoid hitting the tarmac and slamming your head. I received a monstrous concussion this Spring in a wreck during a training ride, that took 9 months to recover from (and I’m still not 100%). I firmly believe that my helmet saved my life, but NO helmet can prevent concussion. Remember, it’s the g forces of impact and the brain sloshing around in the skull. MIPs technology can’t prevent that at all. The best helmet in the world can’t prevent concussions. This is why people get concussions from whiplash–even when they don’t hit their heads. I’m going to stick with my older Bell models . . .and try not to hit my head again. The video seems to show the most benefit of the MIPS system in relieving impact pressure / twisting to the neck more than a benefit to the skull. As another post indicated, the impact still would seem to shake the brain inside the skull. The helmet protects the skull from fracture. But the twisting motion of landing on the pavement and rolling or tumbling on one’s head affects the neck. And who wants to survive with a broken neck. Hmmmm. This is interesting. Incorrect. Rotational injuries are the most serious type of brain injury. So it is both neck and brain at risk from rotational forces. I spent a night in Hospital A & E department was wearing a non MIPS mountain bike helmet, yes the helmet prevented laceration injuries to head and face but received a blow to the right temple causing concussion from polystyrene in the Helmet is too dense to put in into perspective near my home there are major road widening works with a bridge being demolished there is a 52 ton pedestrian and cyclist bridge mounted on Polystyrene to reduce weight. If a bridge can be placed on polystyrene what will it do to your head when you hit the ground hard coming off your bicycle in my case it was 24 hours being monitored for a head injury. The MIPS will never stop a concussion, just do to the fact that the helmet still compresses the brain into the helmet, and that alone, makes this helmet no better than the rest. There is a helmet on the horizon that will mitigate all concussive forces to less than 10 G’s and its coming soon! I’ve had two bad bike crashes in the past eight years, and in both cases my helmet saved my head and perhaps my life. I ended up with a concussion from one of them, but the helmet took the brunt of the injury. I bought a MIPS helmet (Smith Optics Overtake MIPS) last summer. I can’t imagine riding without the safest technology available. I understand MIPS is billed as a better & safer helmet design. Last season I bought a Smith Forefront MIPS helmet. This helmet is unable to sit properly on my head, it constantly floats around in an uncontrolable manner. It has gotten worse as I used the helmet more….it is so bad now that I see it as a distraction while riding. Making my new MIPS helmet unsafe, quite ironic! I don’t think this is ready for prime time. Also page 16-18 here, biased researcher but regardless of interpretation the numbers are most likely real.